Those were just some of the words people who recently visited the Holy Land with Bishop Ruben Saenz Jr. used to describe their trip. The seven-day adventure took the group of 61 people to historic churches marking the traditional locations of Jesus’ birth, ministry, conviction, crucifixion and resurrection. He went on to explain that over the course of our time there, he would consider it his personal failure if we didn’t think of Jerusalem and all of the Holy Land as part of our shared heritage. He also promised that up until then we had been reading our Bibles in black and white. By the time we leave, he promised, we would see the Bible in color. Our group left with was a profoundly different view of geography of the area around the Sea of Galilee and around Jerusalem, particularly the locations of events we celebrate during Holy Week. We also did, indeed, connect with the heritage we all enjoy as followers of Christ. And all of it came across in living color. There were so many wonderful moments from our journey that it’s difficult to settle on just one or two defining moments. The photo album below showcases our destinations with some captions to explain the significance of some of the images. For example, we took a short boat ride on the Sea of Galilee. On that day, the waters were extremely calm. But it didn’t take much imagination to see how those waters can become terrifying when they are whipped up by the wind. You could almost see Jesus calming those waters (Matthew 8:23-27). You could almost see Him walking on the water (Matthew 14:22-33). We saw the potential location of the famed manger from Christ’s birth story and the hillside where shepherds almost certainly would have been tending flocks on a silent night more than 2,000 years ago. In fact, it was on our way to the Church of the Nativity in Bethlehem when one of our travelers, Charley File, fell ill to a heart ailment. Medical professionals in our group performed CPR, and somehow Charley started on the road to recovery. I’m happy to report that Charley and his wife, Kathy, made it back to the United States a few days after our return, and he is scheduled for surgery to fix the problem. What a better place for a resurrection story than the Holy Land, right? Bethsaida — A small hamlet from which at least three disciples — Peter, Andrew and Philip, and maybe two more — came. When you walk the ruins, you gain a real appreciation for how such a small place provided the starting point for so many of Jesus’ closest followers. It makes you wonder how many great people of faith are being called to ministry in the small towns of Kansas and Nebraska. Capernaum — A small town near the Sea of Galilee that Jesus used as home base for the bulk of his time in ministry. It’s likely the location of where Peter, or at least some of Peter’s relatives, lived. Magdala — Home to Mary Magdalene, amid these ruins we found a modern worship center with pillars dedicated to famous women of the Bible. One post, however, remains blank, a tribute to women in ministry through the ages, including today. Valley of Doves — A peaceful mountain pass on the north side of the Sea of Galilee, it is where Jewish zealots likely lived and from where they launched attacks. It’s also likely the setting for Jesus’ parable about the Good Samaritan. 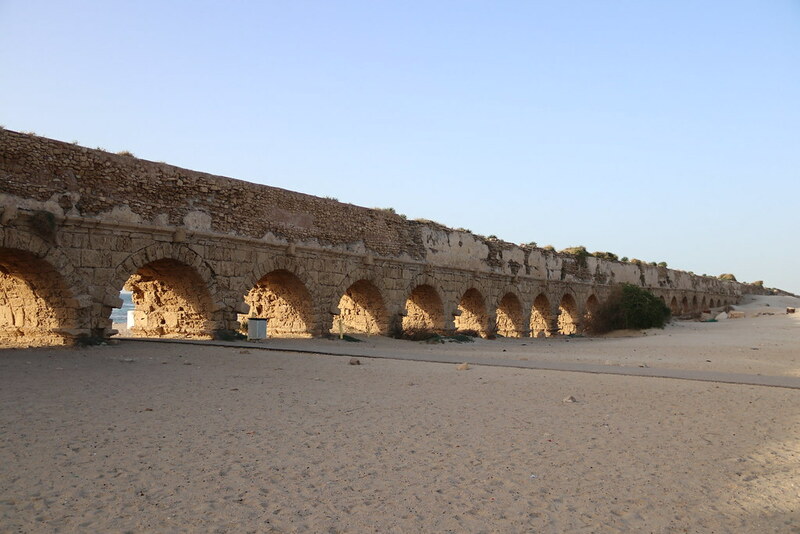 Caesarea by the Mediterranean — With its grand aqueducts and stadium alongside ruins of a grand palace, this is the place that helps travelers understand that King Herod — for all his paranoid faults at the time of Jesus’ birth — was a masterful builder. Sepphoris — A city on a hill that served as the capital for Herod Antipas, who ruled over the center third of Israel after the death of Herod the Great. It features amazing mosaics on the floor of part of the ruins. Miggido — Another city on a hill, this one overlooks a valley that we read about in Revelation. Its ominous name in Hebrew is Armageddon. Of course, our travels took us to expected locations, such as the Church of the Annunciation in Nazareth, where Mary learned she would give birth to the Son of God. In fact, churches throughout the Holy Land commemorate key parts of our narrative. Not the least of those is the Church of the Holy Sepulchre in the old city of Jerusalem. How massive is it? Within its walls are the traditional locations of where Jesus was crucified and buried. Both locations were outside the city walls in Jesus’ day. One of the most moving experiences was a brief stop at the Basilica of Agony — or Church of All Nations. Our group then gathered for a devotion just across the narrow street in the Garden of Gethsemane. I’ll admit it was pretty cool to see my wife, Amy, provide a mini-sermon in the garden where Jesus asked to be spared the cross but also where He agreed to follow through with God’s will so humankind could be saved from sin and death. And, of course, I can't leave out the tremendous view from the Mount of Olives, from where the entire Temple Mount is visible. There are many other locations, but you can check out the photos above and the videos below to see them for yourself. One thing you won’t see in those photos or video is all-out conflict. If we’re honest, thoughts of the Middle East bring up visions of armed combat and terrorism. There may have been a little tension, but as we walked the streets of the old city of Jerusalem, our group of United Methodist Christians interacted with Jews and Muslims. We saw Christians interact with Muslims. We saw Jews and Muslims talking together, working together, and living together in close proximity. They coexist, shunning stereotypes of hatred. This is their home, and they only want their families to be safe and happy. One very visible sign of trouble was “the wall.” This one was built by Israelis to keep Palestinians out. It’s easy to see why the wall exists, given the troubles in the past with Palestinian-based terror attacks. But building the wall in the name of safety may have gone too far the other direction. Palestinian Christians talked about the need for cisterns so they could collect water for use on the one day of every 20 that they are allowed to collect water via the Israeli infrastructure. If they run out of water before the 20-day cycle is complete, they are simply out of luck — a real humanitarian concern. The differences between amenities in Israel and in the Palestinian-led West Bank were enormous. Bethlehem, Jericho and other West Bank cities looked far removed from the more modern look of Jerusalem or Tel Aviv. We were treated one night to a discussion between a Palestinian man and a Jewish businessman (in fact, the owner of the hotel in which we were staying in Jerusalem). It was an impassioned back-and-forth discussion, and I had the opportunity to talk to both men following the presentation. The Israeli gentleman talked forcefully about the need for security and the difficulties of negotiating with Palestinian leaders because the group in the West Bank was different and didn’t communicate well with the group from the Gaza Strip. The Palestinian man talked about the need for basic human rights and compared his people’s plight to that of the American Indian. Both men did agree on something: Resolution will require regular, everyday people to continue to show respect for each other as leaders of goodwill swallow pride and put the good of others ahead of political interests. From the fortress of Masada to the Dead Sea scrolls found at Qumran, from the Holocaust remembrance center, Yad Vashem, to the Dead Sea itself, from the streets of the old city of Jerusalem to a massive model of how the city developed since the days of King David, our group learned at each and every stop. And what was a black-and-white entrance into the Holy Land gave way to a cascade of color that will forever flow from the scriptures as we read from now on.